In an isoscele right angled triangle, the perimeter is 20 metre. Find its area. The area of a triangle is 615 m². If one of its sides is 123 metre, find the length of the perpendicular dropped on that side from opposite vertex. Let ABC be the isosceles triangle and AD be the altitude. Let AB = AC = x. Then, BC = (32 – 2x). BD = DC = (16 – x). How many squares are there in a 5 inch by 5 inch square grid, if the grid is made up one inch by one inch squares? Let the area of two squares be 9x and x respectively. The area of a square field is 576 km². How long will it take for a horse to run around at the speed of 12 km/h? A rectangular parking space is marked out by painting three of its sides. If the length of the unpainted side is 9 feet, and the sum of the lengths of the painted sides is 37 feet, then what is the area of the parking space in square feet? = 37 or b = 14. = (9 × 14) sq. ft.
⇒ ℓ = 30 – 2b. ⇒ b = 10 or b = 5. When b = 10, ℓ = 10 and when b = 5, ℓ = 20.
so its dimension is 20 m × 5 m.
A rectangular plot 15 m ×10 m, has a path of grass outside it. If the area of grassy pathway is 54 m², find the width of the path. Let the length and breadth of the original rectangular field be x m and y m respectively. Now, poles are fixed along the boundary at a distance 3m. 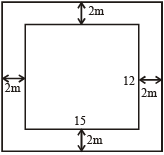 If the perimeter and diagonal of a rectangle are 14 and 5 cms respectively, find its area. A square carpet with an area 169 m² must have 2 metres cut-off one of its edges in order to be a perfect fit for a rectangular room. What is the area of rectangular room? A picture 30 inch × 20 inch has a frame 2½ inch wide. The area of the picture is approximately how many times the area of the frame? A typist uses a paper 12 inch by 5 inch length wise and leaves a margin of 1 inch at the top and the bottom and a margin of ½ inch on either side. What fractional part of the paper is available to him for typing? A rectangular lawn 70 m × 30 m has two roads each 5 metres wide, running in the middle of it, one parallel to the length and the other parallel to the breadth. Find the cost of gravelling the road at the rate of Rs 4 per square metre. The length and breadth of the floor of the room are 20 feet and 10 feet respectively. Square tiles of 2 feet length of different colours are to be laid on the floor. Black tiles are laid in the first row on all sides. If white tiles are laid in the one-third of the remaining and blue tiles in the rest, how many blue tiles will be there? = [(20 – 4) × (10 – 4)] sq. ft.
= (96 – 32) sq. ft = 64 sq. ft.
Perimeter = Distance covered in 8 min. Then, 2 (3x + 2x) = 1600 or x = 160. ∴ Area = (480 × 320) m² = 153600 m². Therefore, b = 5 m.
The length of a room is double its breadth. The cost of colouring the ceiling at Rs 25 per sq. m is Rs 5,000 and the cost of painting the four walls at Rs 240 per sq. m is Rs 64,800. Find the height of the room. A rectangular plate is of 6 m breadth and 12 m length. Two apertures of 2 m diameter each and one apertures of 1 m diameter have been made with the help of a gas cutter. What is the area of the remaining portion of the plate? Since, two apertures of 3 m diameter each have been made from this plate. Four sheets 50 cm × 5 cm are arranged without overlapping to form a square having side 55 cm. What is the area of inner square so formed? = 45 × 45 = 2025 sq. m.